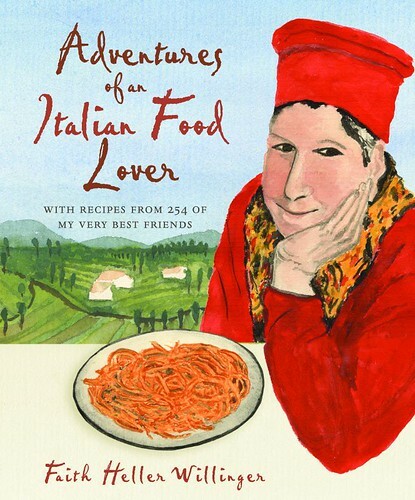 I know that a lot of bloggers have already raved about Faith Heller Willinger's lovely book; Adventures of an Italian Food Lover. This is really a gem of a book - if you like Italy, and Italian food. It has a different layout than most other books, and it focuses on the people rather than on the food. In a way - the food is still very much the focus, of course. After all, that's what this is about. The book is divided by regions, and then further divided into starters, mains, desserts and so on (or rather, antipasto, primi, secondi, dolci) and with a nice section of text to each recipe, presenting the person behind it. I like Willinger's style of writing, and this is a great read for any foodie. It might not be a definitive Italian cookbook, but it feels more like a treasure chest of cherished recipe favorites - and I much prefer that. The only thing I miss is photographs. The book is illustrated, and very nicely so, but I still really do enjoy photos of food in my cookbooks. Then again, this is not really a cookbook, in the classical sense. What this really makes me want to do is not so much cook, but travel. Oh, travel. For a long time. In Italy, obviously. She writes about all the places she visits, and the friends she has, in such a loving and heartfelt way that you immediately feel welcome in her life. Although I'm sure she won't want to have ten thousand readers show up on her doorstep in real life - but it sure feels like she'd be happy about it. Oh, I have to find it right away! I love Italy and Italian food... I will probably just end upp longing to travel, though. Den ser glad ut. Jag älskar naivistiska illustrationer. Det är däremot lite svårt att visualisera en rätt utan bilder.